Yes, you read the title right. Kettlebells have been around for centuries, originally being used in Russia before making their way around the world. They aren’t only used for having an awesome workout, but may also be a solution for your back pain with proper prescription. 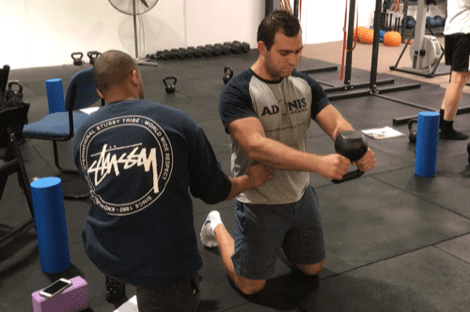 Recently Precision Physio St Marys Exercise Physiologists Nick and Tyrell were joined by Precision Physio Concord’s EP Chris, for a weekends intensive training in Melbourne, the subject being a specialised course in Kettlebells for lower back pain. The course was headlined with Andrew Lock who is a world-leading back pain specialised and Andrew Read (pictured above) who is a world-class kettlebell instructor and the first Australian to be certified by two different kettlebell organisations (RKC and SFG).